The sedi­tious edi­tions in the show are works of “rebel­lious dis­or­der” that act as an intel­lec­tual call to arms to the pub­lic at large to stand against com­pla­cency. Each artist repur­poses the pop cul­tural zeit­geist of the 50’s post­war era with punk rock bones to cre­ate some­times com­plex some­times bone chill­ingly sim­ple mes­sages chal­leng­ing us to look harder at the pol­i­tics and gov­ern­ments we take for granted are work­ing in our best inter­ests. On exhibit will be orig­i­nal works and lim­ited editions. 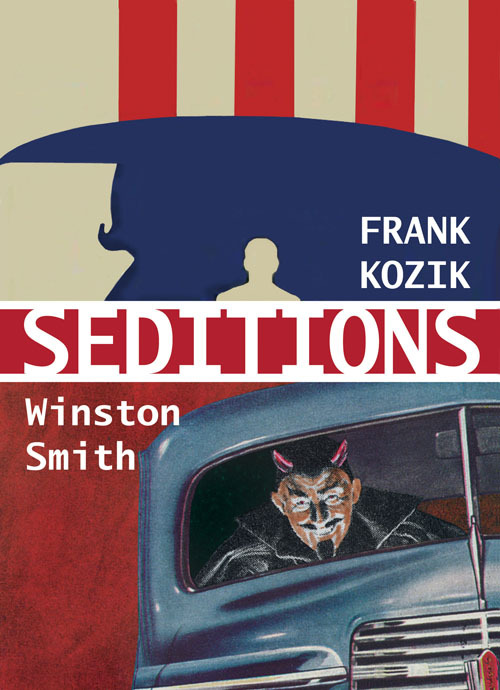 Kozik and Smith share the expe­ri­ence of hav­ing lived in post­war Europe in the early to mid 70’s, a period of intense upheaval. Kozik’s child­hood in Franco Era Spain was full of visu­ally influ­en­tial author­i­tar­ian acts and imagery, evi­denced by his use of the pro­pa­ganda poster for­mat. By con­trast Win­ston Smith’s time in Italy as a teenager was full of class strug­gle and socio-political tur­moil turned to vio­lence that one writer claims “amounted to anar­chy.” This state of chaos mixed with a 50’s child­hood in a “fly­over” state comes into stark relief in his polit­i­cally tinged collage-montages. Using imagery of the 50’s and beyond as his start­ing point, Smith “kid­naps” them from their orig­i­nal con­texts, re-purposing them into polit­i­cally charged tableaus that con­front the viewer with the para­doxes and incon­gruities occur­ring in front of our eyes. With a sub­lime humor, Smith talks to us of deep and trou­bling issues with friendly imagery. Kozik uses the tem­plate of the pro­pa­ganda poster preva­lent dur­ing and post WWII in the US and Europe to cre­ate art print and music poster edi­tions full of visu­ally grip­ping and supremely graphic sce­nar­ios rife with cul­tural mes­sages of chal­lenge. He has recently turned his graph­i­cally keen eye to the world of sculp­ture, cre­at­ing lim­ited edi­tion works of some of his most well known images. Smith first became known (and later beloved) for his col­lab­o­ra­tions with punk leg­ends Dead Kennedys and his numer­ous album cov­ers, inserts and fly­ers for the band in their for­ma­tive years. His tech­nique of cut­ting out by hand and glu­ing each indi­vid­ual ele­ment has inspired a gen­er­a­tion of artists. He is clas­si­cally trained in Renais­sance art, hav­ing left the U.S. in 1969 to study at the Acad­emy of Fine Arts in Flo­rence, where he lived for sev­eral years before mov­ing to Rome. Over the last 35 years, Win­ston has had numer­ous one-man shows in San Fran­cisco, Los Ange­les, New York City, Lon­don, Berlin, Antwerp, Rome and Tokyo, as well as group shows through out the United States and Europe. He lives and works in San Francisco. Frank Kozik is an entirely self-taught artist whose artis­tic career rose largely out of his enthu­si­asm for Austin’s grow­ing unde­ground punk rock scene in the early 80’s. He tran­si­tioned to silkscreen­ing large col­or­ful con­cert posters, cre­at­ing art­work for a diverse array of musi­cians such as Pearl Jam, The White Stripes, The Beastie Boys, Green Day, Neil Young and Nir­vana. He moved to San Fran­cisco in the 1990’s where he started his own music label. In 2001 he tran­si­tioned full time to cre­at­ing fine art, design and art toys. He cur­rently lives and works in San Fran­cisco with his wife, Sharon, and their four cats.